Win Pitch Perfect 3: Hitting a high note for the big finale | SWITCH. The fabulous Bellas of Barden University are back for one last curtain call! Anna Kendrick, Rebel Wilson, Hailee Steinfeld, Brittany Snow, Anna Camp and Hana Mae Lee return and are joined by Australia’s own Ruby Rose and John Lithgow in the final chapter of this beloved series. Outstanding performances and a variety of new tracks build up this aca-family as they take to the stage and claw their way back to the top. Exhilarating and exciting as ever, re-join the Bellas and raise your voice to the high-spirited closing act of the franchise that sparked a worldwide phenomenon. Bid a bittersweet farewell to the Barden Bellas in this brilliant curtain close. The 'Pitch Perfect 3' competition has now closed. Winners will be announced shortly. Competition opens at 5pm AEST on Sunday 15th April 2018 and closes at 11:59pm AEST on Sunday 22nd April 2018. Five winners will be chosen at random on Monday 23rd April 2018. To successfully win, entrants must fulfil the above entry conditions before the time the competition closes. Current members/followers are eligible to enter the competition. Only one entry per person. Only one winner per household. To be a valid winner, the entrant must not have won a prize from SWITCH within the last 28 days. Each winner will receive one Blu-ray copy of 'Pitch Perfect 3'. By entering, you agree to receive occasional emails from SWITCH in the future. If you decide to unsubscribe from these updates, any further entries will not be applicable. Only Australian residents are eligible to enter. 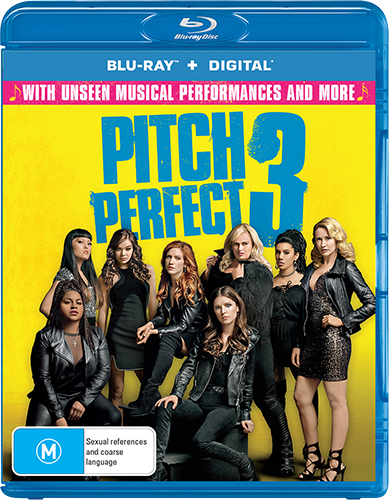 'Pitch Perfect 3' is available on 4K Ultra HD, Blu-ray, Digital and DVD on Wednesday the 18th April 2018 from Universal Sony.